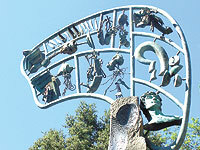 The small sculptures at the top of David Middlebrook’s archway represent the history of the people in the Gordon Park area. • Native Americans, who teach stewardship of the land, are depicted by a plant with its roots. • Germans, who are the engineers but who also get stuck in their ways, are shown reinventing the wheel. • Africans, who created jazz and rap, truly American music forms, are represented by microphones held in Jackie Robinson’s baseball glove. A second icon representing a mask reminds us that modern design draws on an African base. • Italians gave us a love of art, shown in Michelangelo’s David head. • A bag of groceries tipped on the side depict the French and their culinary skills. • Flowers represent the English poets who wrote about the spring as they passed the cold winters. • The Vikings, who visited along ago, are represented by sardines. “Just as a reminder that they didn’t try very hard,” Middlebrook jokes. • Two broken pieces of classical architecture represent the building skill of Mexican workers. • Books are brought to us by great Irish writers, who also brought Catholicism. • Asian technology powerhouse is shown as @ signs falling out of a gunny sack. • A broken piece of the Old Testament represents the moral code the Jewish faith has given us. • Coffee beans represent South Americans who can manage to make art out of anything. Interviewing David Middlebrook is like riding a Ferris wheel. Your perspective changes as he moves you up and down through the elements of his work. With ease he explains the research and planning that went into the 20-ton archway that invites passersby into Gordon Park and the neighborhood. “Public artists should think of themselves as site artists first and sculptors second,” Middlebrook explains. “I don’t make things that are transferable. I think public art should be created with only one place where it can go. Not only conceptually, but in the visual, tactile and texture as well. It is literally the artist’s reaction to the place and the people who live there.” Middlebrook says three things go into the conceptualization: the site (weather, atmosphere, ambiance, vegetation and sensibility), the people, and the history. “I’m really into the real history — the land formation, the geology. I believe the geology and archeology are woven together. People don’t just happen to be a certain way. The land, the weather, all of it affects what we’ve become.” That takes us to the base of the archway. It is a large, white, angular piece of marble representing the glacial age that formed the Great Lakes. It was the glaciers that distinguished this region from the grasslands of the Dakotas. The lakes provided fresh water and food for the first inhabitants and a passage for immigration and trade. They still define our regional character as we defend them from our own sewage and commercial exploitation. In addition to forming the lakes, the glaciers made iron ore accessible to the region and led to our area’s designation as the Rust Belt. At the top of the sculpture is an anvil. “The Industrial Revolution provided a lifestyle of employment and culture for several generations of people. Now, of course, it is all gone.” The rust and deterioration of the anvil’s surface makes it look like the hull of a discarded washing machine. “I have depicted it as a sort of 1950s metaphor. I think the ’50s was the last of the age of innocence when we didn’t think we’d run out of fuel or energy.” The anvil is frozen in the glacial ice. “It represents the ignorance of the old fashioned way of ‘hammering it out.’ The ‘might makes right’ mental block. Work hard and it will be all right. Not work smart.” The German character of Milwaukee, perhaps? Now, we are at the archway. Here we have what Middlebrook calls a “culture kit.” Think of the car model kit where tiny parts come molded together in a plastic frame to be twisted off and placed where they belong. The culture kit contains icons representing what the human heritage of Milwaukee has contributed, from Native American to the most recent immigrants. The head of Michelangelo’s David reminds us the Italians have given us a love of great art. Germans, who are the engineers, are depicted trying to reinvent the wheel. Microphones recall the African-Americans who gave us “The only original American art form–jazz–and the most creative recent form–rap.” Another icon, based on African masks, acknowledged that Africa has brought us the entire 20th century of modern design. The icons are tied to 22 massive fingerprints on a granite column that make the other side of the arch. “The fingerprints are a metaphor for the hands that built all the things they did in making their living.” They were collected from the community around Gordon Park–African American, German, Mexican, and of course the many cultural mixes we find in Riverwest. The size of the fingerprint is tied to the demographic presence of the group in the community. The depth represents the time they have been here. Middlebrook was selected unanimously by a judging panel consisting of residents, artists, county engineers and architects, and County Supervisors Willie Johnson, Jr., and Penny Podell. The Los Gatos, California, artist impressed the panel with his knowledge of materials and ability to blend the artistic with the historical to create an abstract work with literal elements. He has created 30 pieces of public art. The sculpture, whose working title is Tip, is funded by Milwaukee County, which set aside a percentage of the cost for rebuilding Gordon Park (over $2.5 million dollars) to incorporate a $50,000 work of art in the park. The piece was a year in production. 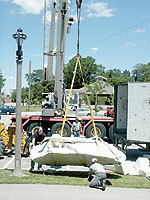 Middlebrook traveled to Italy to pick out the two huge stones that form the base of the piece. He then toured Alaska to view and capture the essence of a glacier. The ten sections of the work were shipped by rail and truck from California. Needless to say, the grant didn’t cover all expenses. “Public art projects are always a labor of love,” Middlebrook said. Middlebrook said that his experience in Riverwest has been great. Hopefully we will leave our mark on his work as he is leaving his mark on our neighborhood. The latest addition to Gordon Park is a sculpture by David Middlebrook. 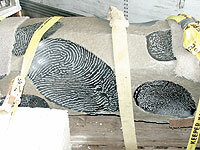 This photo shows the “culture” kit portion of the sculpture atop a basalt column bearing residents’ fingerprints.